I don't know if anyone else is interested in this but thought I would post it just incase others besides myself might find it helpful. Its very simple at the moment but I will be working on adding more abilities as I progress with why I created it. Its good to be able to create persona's but constantly manually writing the code is boring boring boring......and time consuming. I might explain more about why I have done just this simple version to start with rather that a completed version. Its basically because it does what I need it for right now. The rest I will get into later. If people are interested I will post my improved codes I write but only if there is interest in it. Anyway. Here is some images that shoes what it does now and explains how to do it. Could it be made to work for the move commands? They are a bit trickier, with having to set the speeds, as well as the beginning, ending, and looping motions. I have great interest in this tool.... thanks. Very nice tool. Combines existing personas quickly. Speeds up the process immensely. With iClones Curve Editor you have access to "Hip Trajectory", "Pelvis Twist", "Arm Swing" and more. With iClones Dope Sheet you have access to "Foot Spacing"
Curve Editor: Raise the hip height adds a bounce to the walk. Lower the hip height creates a crouching walk. now you have a 'Limp" or create a stumble (step into a hole or trip over something) walk cycle. ...now the hard part.... coding it. I know how to create persona, but not code it. Not sure yet how far I am going to go but I will definitely be expanding its capabilities. I have been organizing all the contents/animations etc etc that I have. I have a folder named by the person who I have bought contents from and in that folder are more folders named by the content pack I bought. 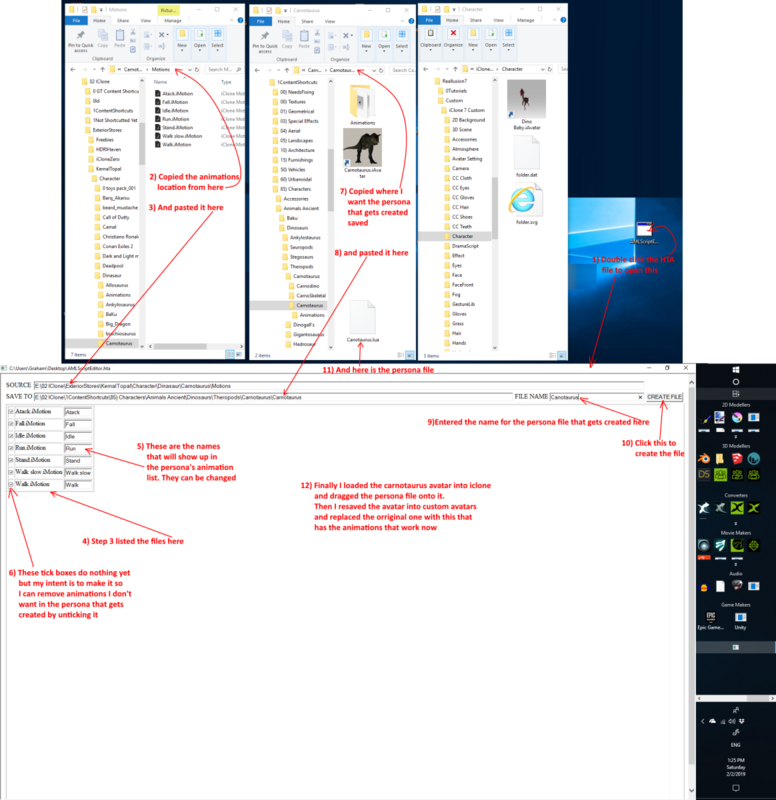 I then create shortcuts of all their contents so I can organise all the contents I have in a way that makes it easy for me to find things for projects I am working on. I can rename the shortcuts however I want, duplicate them so they can be organised under more than one setting. But I can still tell who made it and what pack it came from by checking the properties of the shortcut. One difficulty of that though is any persona's in a character no longer work because they reference the location the developer put them in and I have them all in different folders now. I was manually changing their locations in their persona's and that just takes so much time. That's why I have done this tool as it is now, to help me correct all the persona's in the models I have. However soon I will be looking into making this tool so I can create animations in the persona that combines more than 1 animation. Just like the start walk, loop walk and end walk methods in many of reallusion's character persona's. And there are quite a few other capabilities for creating persona's that I will be looking into adding as well. Your methods look to be progressing well. Its not something I have looked into yet but you have just raised my interest into looking into this and seeing if I can add any of these things into this tool if it might make things easier. I don't know though because as stated its not something I have looked into yet. Back in the day there was a tool to make Personas. It works except for some issues with path names, which is easy to fix. Having such a thing right in iClone would be so awesome! Yes, I used it in iClone 4 but it got removed and if my memory is correct reallusion said they were going to replace it with a new version ????? Anyway I have been waiting and waiting but decided to write my own because it doesn't seem to be coming. I have links to those documents of how it used to work which I will be using as a guide for how I put this together in the future. Although I do wish reallusion added something for creating them from within iClone7 like it used to be. I for one miss it. 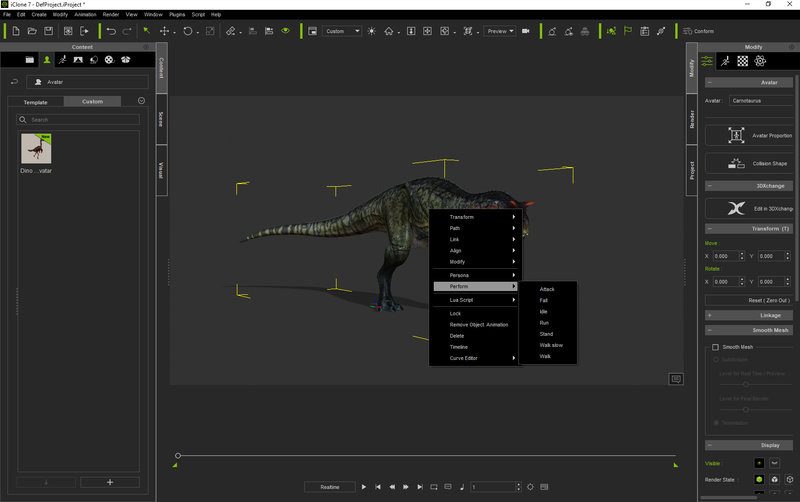 You can create the Performs using 3DXchange, but your system inside iClone is much more convenient, for sure! With the AML to Lua, To Python, I suppose it is up to you and the other Python developers now. AFAIK most everything AML could do still works. I say most because I could not get the animation only applying to specific nodes to work last time I tried. An even better solution to that would be a masking feature for motions inserted from the Content Manger. There is no longer anyway to have the "Idles" play automatically. But there are many other ways to accomplish that anyway. I did make a "dancing" idle back in iClone 5 by assigning a bunch of dance moves with random probabilities. It worked surprisingly well! The AML may just be legacy code that will never be removed from iClone. I don't know. ...you have just raised my interest into looking into this and seeing if I can add any of these things into this tool if it might make things easier. Change Hip trajectory, Pelvis Twist, Head & Shoulder Roll, Knee angle and much more. I can rename the shortcuts however I want, duplicate them so they can be organised under more than one setting. 'You KNOW" where to find the data and the skill to script the tool. Somewhere inside there is a reference to animation data. I don't know if it's an (.ini) file or whatever. "Editing values in this file along with your skill of scripting will provide an awesome tool for iClone." Whether you add this to your tool or not.... your tool (AS IS) is most useful and welcomed.